If your club is doing something that works then we want to hear about it. Please share with us some of your club's mentoring highlights and we may share them with other clubs. At the national association for Amateur Radio we have always felt that the local radio club is where the learning takes place. The local radio club is where the newcomer begins the journey of discovery and the seasoned veteran keeps informed of the latest technology. Regardless of where we are on our ham radio journey our local radio club is where we find our friends. The term "Elmer" means someone who provides personal guidance and assistance to would-be hams. The term first appeared in QST in a March 1971 "How's DX" column by Rod Newkirk, W9BRD (now also VA3ZBB). Newkirk called them "the unsung fathers of Amateur Radio." As you can see, the term is not very old. Prior to the first use of Elmer as the one who guided and encouraged us, what were these folks called? We have received a lot of suggestions; teacher, mentor, tutor, guide, helper, sage? All are appropriate but my guess would be that first and foremost they were called friend. Check out what clubs are doing to mentor their members. Program Description PCARS has tried a number of approaches to assisting fellow hams (new ones in particular) with gaining experience in the hobby and overcoming any stumbling blocks that they run into. We have had about a dozen hams volunteer to be mentors on specific topics and then listed their names, calls and topics in our newsletter as a handy reference. PCARS offers two Technician classes per year and includes a one year membership in the cost of the class. Informally, we reach out to the new hams to encourage them to attend meetings and participate in activities and events. We have two HT's that we use as loaners so that they can get on the air. As club members they are then also entitled to take our General upgrade class at no cost. The classes have been taught at the club site so that they have the chance to try out the radios in the club's shack. A big push is made to get them involved at Field Day. The club holds weekly Special Interest Group (SIG) meetings. A different group meets each week and they included Digital, CW/QRP, Antennas, and DX/Contesting. They have been a great way to get new hams involved in each of those aspects of the hobby. PCARS also maintains a Yahoo group that all club members are encouraged to join. That enables them to post questions about amateur radio topics and they always get a prompt and helpful response from other club members. We also encourage participation in ARES and RACES locally, especially for new hams, and pair them up with hams who have experience in public service events and can help train them. Our club net manager regularly recruits members to serve as the NCS for one of the weekly nets and he will have them run the net from the club station so that he can help them overcome those first net jitters. Perhaps a bit subtle as a mentoring technique, but important never the less, club leaders personally welcome members at club meetings and events. They then go out of their way to make introductions and try to pair folks up with those who might have common interests. Just before BARCfest I was called upon to assist a widow of a deceased ham to appraise his ham radio gear estate. The widow was absolutely at a loss to figure out what she had and even more bewildering, what it was possibly worth. What had precipitated her call was that some guy from California had called her and offered her $1000, sight unseen, for the entire station. She was again befuddled as to how he knew to call her and if that was a good offer. There are numerous people out there that lurk around the SK columns of QST, contact the widow when they can and make a living from these types of low-ball deals. You can bet that if she had taken that offer, all she sold him would end up on eBay within the week for at least twice the price. After looking at the gear, I made up an inventory list and looked at some Internet sites including eHam and eBay for some idea of what items like she had were selling for recently. At my lowest possible valuation, she had at least twice the value than she was offered. One item was a pristine old National receiver, vintage 1936 that looked like new! The main station was a complete vintage Drake station worth close to $1000 by itself by any collector. So, my advice to one and all is to do a good inventory of your ham radio gear, with at least the make, model number and an approximate dollar value. Leave this information and disposal instructions with your XYL and/or family as to what to do in the event you suddenly appear in a future issue of QST as a Silent Key. If you are going to leave the equipment to some organization, then you need to make that information known in a codicil to your will. Do it now. You could be unfortunate enough to have some impairment later on that could prevent you from leaving this important info as you would like it handled. This is the second estate in 6 months that I have helped the widow of a ham with little or no idea as to what she had been left with by her husband. With the advent of more and more of our fraternity reaching the last cycle of our lives, it will be a more frequent occurrence, I’m sure. Program Description Due to quite a few newly licensed hams from our classes and VE sessions, we had a lot of questions being asked from what does DXCC mean to how to program new HTs. To devote time specifically to new hams questions we instituted a half hour segment just before our regular monthly meeting. Only new hams were invited to ask questions of 2 or 3 veteran hams. We felt they would feel less inhibited from asking their questions if only their peers and a couple "experts" were present - not the whole club. Currently we are discussing beginners topics as short programs, or at least topics of the night, perhaps an intro to the program which follows the regilar meeting. Our regular meeting follows and they are invited as our guests to attend. Use this form to briefly tell us what your club is doing to coach new hams or domonstrate new things to your club. Please provide a short description of your club's achievements. What is your club's website address? Thank you for your contribution to the mentor prgram. 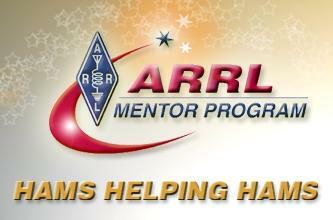 Elmering or mentoring has long been the backbone of Amateur Radio.